A set of three silver plated hatelet skewers. 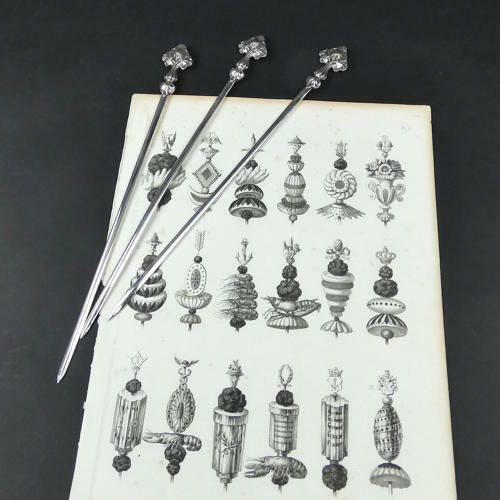 This type of skewer was used for ornamenting meat, fish and also desserts, when taking the food to the table. Examples of them in use can be seen in the image. This is from a cookery book "La Cuisine Classique" printed in 1876. The ends of these skewers are very classical in form, with stylised flowers. Each on has a small, square mark and a name. This looks like the mark of Cristoffle but it is too small to read properly. They date from c.1880. These are good quality examples and they are all in very good condition. Dimensions: The lengths vary. Two are 26.6cm. (10 1/2in) and one is 27.3cm. (10 3/4in). The ends are 2.5cm. (1in) across.